Two years ago, Chuck and I sat at a table across from our realtor and mortgage broker and signed the dotted lines that declared us homeowners. Not a day has gone by when I have regretted that decision or wished our home was bigger, better or different. It would seem that in our case, home ownership is much like marriage- we only grow to love our home more and more over time. Although we haven't made nearly as much progress as I would have hoped in the last two years, I thought it would be fun to journey back and see how our house has become more of a home over time. 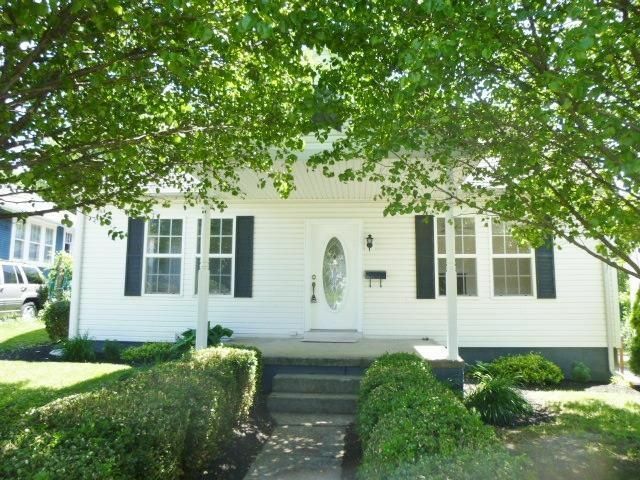 We first spilled the beans about our new house in August 2015. It had been purchased by our realtor at a Sheriff's Sale and then flipped. The instant we walked through it, we fell in love. It just felt like ours. Unfortunately, when Chuck called to put in an offer, someone had beat us to it. We were so disappointed. We'd only been house hunting for a few weeks, but this house had truly felt like the one. So, imagine our surprise when about a week later, our realtor called to tell us the other offer had fallen through and were we still interested? Our gut instinct was right- this was our house! We brought our brother and sister-in-law and our family friend/handyman with us since we knew nothing about real estate. They managed to talk our realtor into throwing a new roof into the price and he agreed. We submitted all our paperwork and a few weeks later we had a closing date. She was ours! Somehow the stars aligned and we got our house just before our third wedding anniversary. Since we have a tradition of taking anniversary pictures every year, we asked our photographer if she would take the pictures inside our new home. These are among my favorite pictures ever taken of us and our family- it was such a happy, joyous and celebratory time. Since then, I've daydreamed about how I want to design and decorate each room. Initially, we wanted to start tackling our upstairs spare room/attic and turn it into a fourth bedroom for Charlie. Unfortunately, because we needed to install a window and do some actual construction, we put it on the back-burner in favor of easier and cheaper DIY projects. Becoming a stay-at-home parent was the catalyst that jump-started our stalled progress. Although I didn't have any money to spend, I wanted to do little things to brighten up the spaces in our house if I was going to have to stare at them day and in and day out. The first room I painted was our dining room. I probably spent about $40 on paint and painting supplies- all of the rest of the decor I already owned. In a matter of a day, our blah dining room was suddenly this peaceful, green, nature-inspired oasis (or at least that's how it felt to me). We planned to have our boys share a room until our fourth bedroom project was complete and Charlie had his own big boy room. Unfortunately, room-sharing did not work out. Charlie would climb in and out of Crosby's crib, steal his binky and keep him awake at night. No matter what we tried, we determined the only logical move was to separate them. We moved Crosby's crib and dresser upstairs into our second blah room- our guest room. We planned for that room to eventually become his bedroom years down the road. But since our timeline got moved up a smidge, I set to work making it more of a little boy's nursery and less of a plain, character-less space. For less than $50, I purchased some paint and new bedding. Over a few days, I slowly added element by element and now my sweet Crosby Loren has a navy, elephant-themed nursery just for him! We still have about half a million things on our growing to-do list, but we're taking it room by room. I like concentrating on one room at a time because I like the feeling of completion and accomplishment when each room is done. One of the reasons we chose our home is because it was move-in ready and didn't need any massive updates. I'm not someone who would do well living in a permanent state of flux and remodeling. I'm not sure which room I'll tackle next- we are hoping to get a king-sized bed in the next year which would set into motion getting our master bedroom how I want it. We also want to add some color to our beige living room and possibly add some more seating. 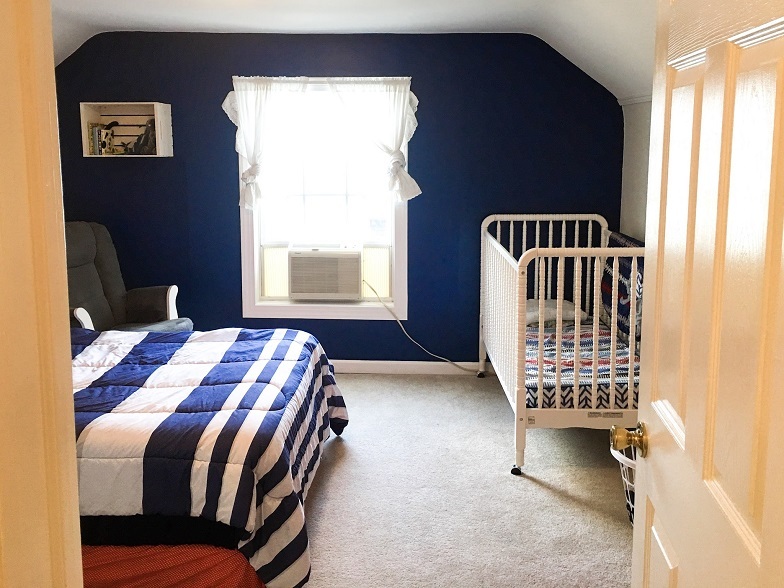 I'd still love to plug away at getting the fourth bedroom in order for Charlie and I'd also like to convert our gross, semi-finished basement into a playroom for the boys. I dream of a kitchen with white cabinets and copper hardware, and I long for some updates to our front and back porches. But for now, I'm happy. We have a roof over our heads and food in our pantry. I have everything I need in that sweet little white house of ours, and I couldn't feel more blessed.